I bought this ibook when I was a student. Almost 10 years ago! After 6 years, I started it up to use Photoshop... and was still doing fine! Without Internet connection, it seems not at all out date. haha. 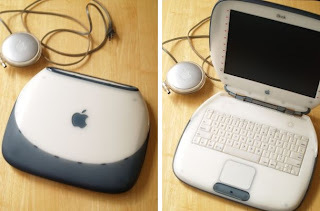 Back to ibook, it has a cute handle. At that time, it was cool if you carry it like a bag... but what if I do that now... People will think I'm crazy!!! I believe some of my blog buddies even don't know what the heck is this style. haha!